Gasket set for 3-port late sprint engines. Does not include engine o-rings. Please note that this is a European gasket set, and most of the European models were not oil injected. The carb gaskets included in this kit may not have the hole for oil injection and if installed would cause your engine to seize. Please compare with your old gasket! 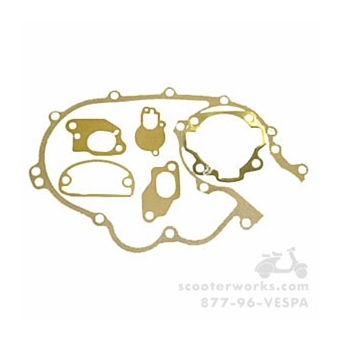 Our Prima carb gasket set includes the injected base gaskets. We highly recommend rebuilding your carb if you're doing the rest of the engine!